It's trash day here at CFC HQ, and we just realized, it's been 3 weeks since we trucked our trash out to the "curb"! Our trash bag isn't even full enough to warrant the fuel-burning trip! I just thought it interesting enough to mention. It feels good knowing that we are producing less garbage, which in turn, lessens our impact on the earth. We recycle everything we possibly can, and if we can't, we try to re-purpose it. It's not that difficult. Once you get used to it, it becomes second-nature. 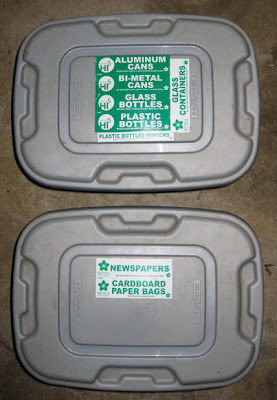 It helps if you have designated receptacles (bins, bags, etc...) to store recyclables, they don't have to be pretty. We use plastic bins that can fit easily into the trunk when it's time to purge.